Agriculture Minister Uri Ariel meets Chinese Deputy Agriculture Minister as Chinese Vise President visits Israel. 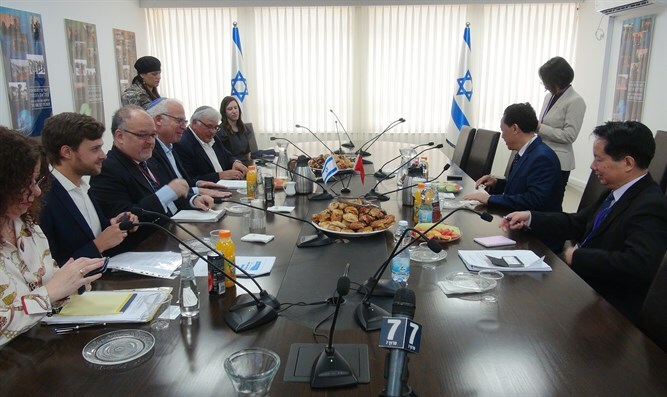 Agriculture Minister Uri Ariel met Wednesday with Chinese Deputy Agriculture Minister Qu Dongyu as part of the process of strengthening the process of trade agreements between the two countries. The meeting was part of a Chinese delegation headed by Chinese Vice President Wang Qishan who landed in Israel earlier this week. Minister Ariel stated: "We welcome the vice president of China and the delegation members who came with him, wonderful colleagues to the State of Israel. We have a common challenge along with China, feeding 1.5 billion people. We see the reality of trade between the two countries good news." Ariel and Dnogyu signed an agricultural agreement between Israel and China.